Combine one of the best board games of all time, based on one of the best sci-fi universes of all time, with awesome visual tech generating really gorgeous graphics, and hulking space marines with giant armor and guns so big that they wouldn’t compare negatively against the cannon of an A-10. What can possibly go wrong?As it turns out, quite a few things. Before I move on, I should probably explain the headline: this game had, and in a way still has, a ton of potential. As a Warhammer 40,000 fan, I was massively excited about it. Unfortunately, the execution of that potential resembles a lot a race that actually does not appear in Space Hulk: Deathwing, the orks. As a warlike race with crude but keen intellect, they’re incredibly capable to create impressive machines from the weirdest array of materials, but those machines tend to work in a rather unpredictable way, and when they don’t, a very angry mekboy has to take a giant wrench to them, not in the usual way you’d use a wrench. This is pretty much how I feel about Streum On Studio’s first person shooter. 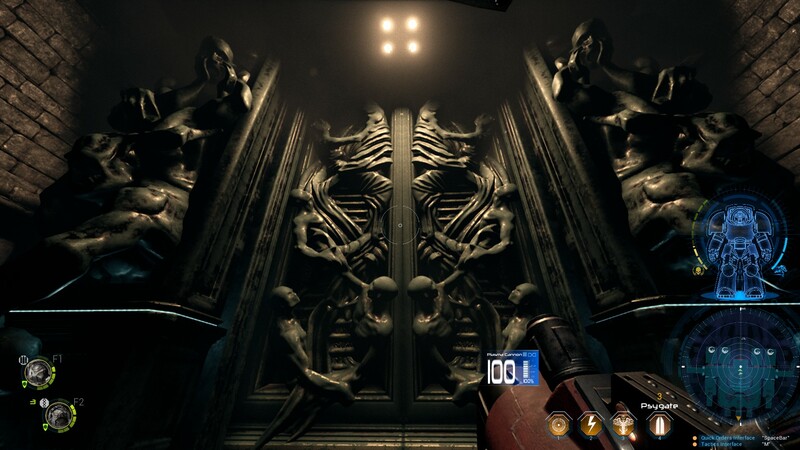 The story is definitely fitting to the Space Hulk franchise. 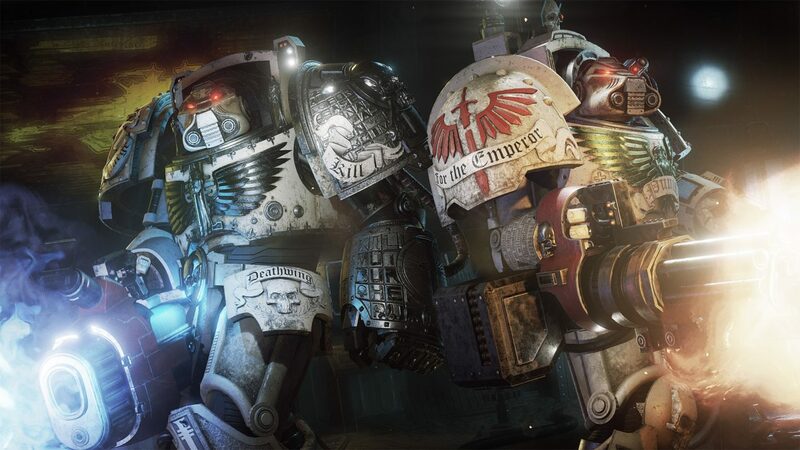 The player is prompted to get into the ornate Tactical Dreadnought (also called “Terminator”) armor of a Librarian of the 1st company of the Dark Angels chapter of space marine, carrying the fearsome “Deathwing” name. A Librarian is one of the few among a space marine chapter who have mastered psychic powers, which are considered extremely dangerous within the borders of the Imperium, with corruption and fates worse than death lurking behind every thought. As such, you don’t just have a majestic array of weaponry at your disposal, but also some really spiffy powers that allow you to toast, electrocute and otherwise massacre your enemies without even touching them. 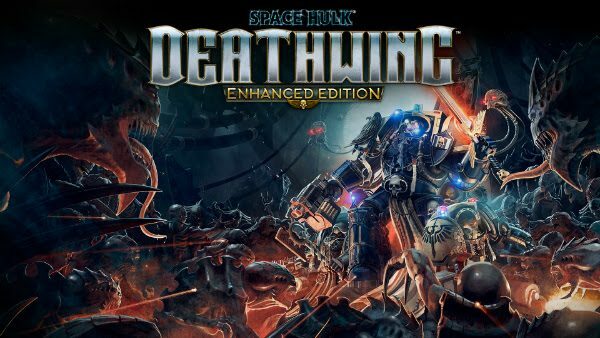 A Space Hulk, which is a massive cluster of space relicts accumulated within several centuries or even millennia, emerges from the warp, hiding secrets that the Dark Angels want to both uncover and keep from their enemies. Squads of the Deathwing board the massive drifting structure, infested by thousands of lethal genestealers and even worse horrors. To put it down simply, for those who aren’t familiar with the setting, you’re a walking magical tank and you’re boarding a giant starship chock full of Alien-like creatures that pretty much behave in the same way as Ridley Scott’s critters, but on top of that some have developed psychic powers, while others are grotesque hybrids with humanoids able to carry heavy weapons. As an additional difference, you’re fully capable of fighting back. Actually, you’re among the scariest creatures on the ship. In comparison, Predators aren’t even worthy to carry the smallest of your guns, which is why you have a chance. 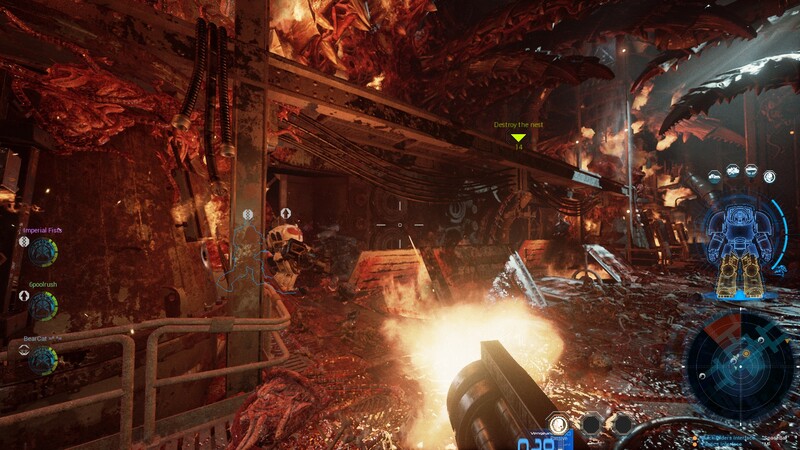 One of the first things that impresses about Space Hulk: Deathwing is its visual presentation. The game is very, very pretty. Assuming that you have the hardware capable to run all that Unreal Engine 4 goodness, it’s certainly one of the most gorgeous first person shooters on the market. 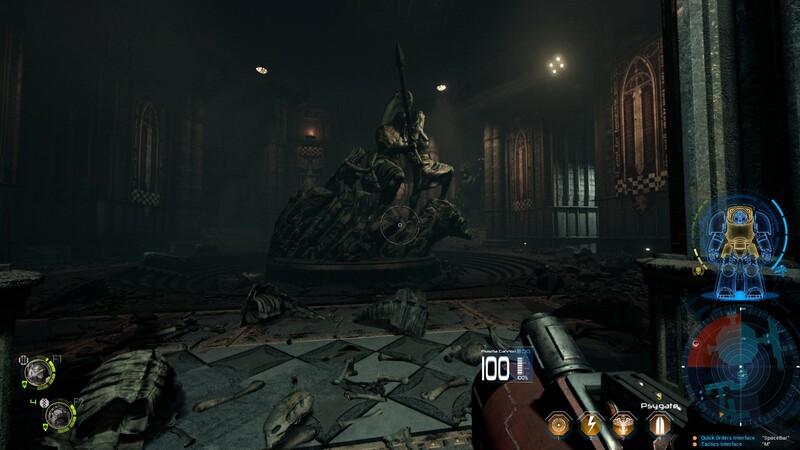 Not only the pure visuals are beautiful, with characters and environments that show an amazing level of detail that perfectly fits the decadent and gothic looks of the Warhammer 40,000 setting, but every environment is carefully crafted to tell the story of the vessels that have accumulated in the millennia to form the Space Hulk, creating an absolutely great atmosphere. Despite the fact that you’re far from defenseless, the sense of oppression and claustrophobia of the hulk is perfectly conveyed by its environmental design and lighting. On top of that, the tension of exploring an environment in which everything besides your squad has very sharp claws and really wants to tear you to pieces, is consistent through the whole game. And yes, They’re coming outta the goddamn walls. Whole hordes of them. If visuals were the only parameter to judge this game, the score at the top of this review would be a ten out of ten. The core gameplay is actually quite enjoyable as well, even if this definitely isn’t the kind of first person shooter Call of Duty fans will feel at home with: when I said that you’re a walking tank, I meant it. You’re slow and relentless, and you rely on your armor to protects you from claws, bullets and missiles. Cover is a completely alien concept to the mind of a Terminator space marine. This is not to say that you’re invulnerable: you can certainly take a whole lot of punishment, but if you lower your guard, your ancient armor will eventually yield, and you will die. 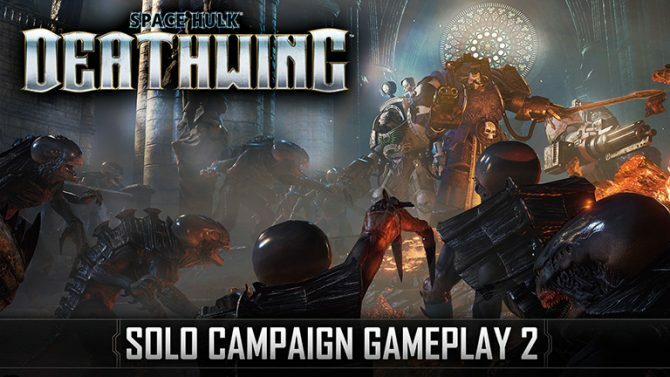 Space Hulk: Deathwing is faithful to the original board game in the way that it’s much more tactical than the usual first person shooter: run and gun tactics will get you killed in no time at all, and basically the whole game is a methodical exploration of the labyrinthine corridors and halls of the space hulk, carefully moving past every corner and bulkhead, in order to clean the whole place of the foul xenos infestation. Doors are actually a pretty unique mechanic to this game. You’re able to hack into the electronic locks which control them, and taking the time to block the doors behind you is actually rather crucial to exploring the vast hulk without being surrounded from all sides and overwhelmed. Of course, if you’re feeling violent, you can simply tear the doors down with your massive melee weapons, but that can prove rather unwise in more than an occasion. You’re also supposed to rely on your squad mates quite heavily for covering fire and healing, and here we find the first big issue: friendly AI really isn’t that smart. They aren’t very good at positioning themselves and at keeping themselves alive. 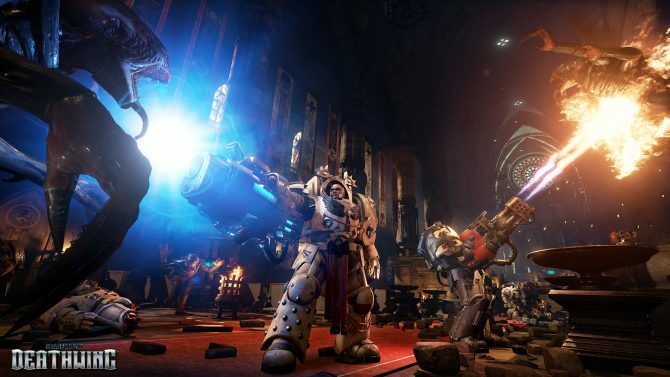 I’m actually of two minds about this: while this can certainly be frustrating, Space Hulk is a tactical game, and once you master actually giving careful instructions to your companions, things become a lot more interesting and fun. The unfortunate secondary issue is that the interface used to give those orders is rather unwieldy. One of the best elements of the game is your arsenal. Every gun has a very unique “personality.” Some are more lethal, but also more prone to jamming, others unleashan extreme amount of damage really quickly, but they run out of juice just as quickly, leaving you defenseless during prolonged assaults. 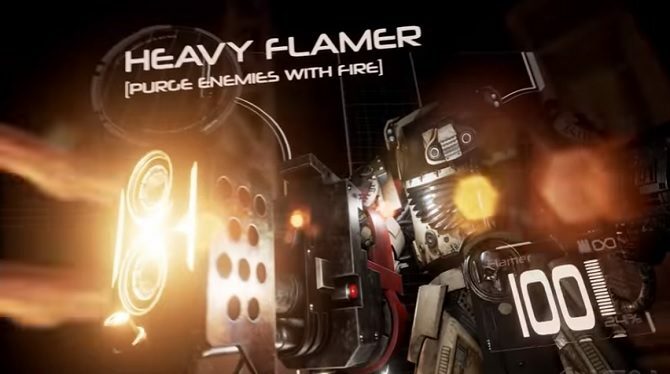 Some fire storms of bullets letting you saturate an area with lethal metal, while others have a much slower rate of fire, but each shot really counts. Warhammer 40,000 is a dark future setting in which technology to mass produce the most advanced guns has been lost, and existing ones are treated as prized relics (and yes, people pray to them). As a result, each weapon has very clearly defined drawbacks and strong points, that make them more or less reliable against different enemies and in different situations. There isn’t a massive quantity of them, but there also isn’t one that I did not enjoy. One further issues that I didn’t find the sounds of the guns sufficiently satisfying: a storm bolter fires .75 caliber bullets that are actually (relatively) small self-propelled explosive rockets. They would definitely benefits from more “manly” sound effects than the ones that have been implemented in this game. Still, it all sounds rather awesome so far, right? It would, if the game wasn’t plagued by severe technical problems. Crashes are certainly not rare, and this becomes an extremely frustrating issue when combined with a rather severe design oversight: you cannot manually save. The game automatically saves whenever it wants, and checkpoints are often very far from one another. The only way to force the game to save between them is to open a portal back to your mothership, but that can be done only an extremely limited number of times in each mission. While this could be considered a pretty valid design choice in a technically flawless game, encouraging careful exploration instead of taking unnecessary risks, it cannot be justified in a title that can crash at any time. I lost count of the times in which I saw an entire hour of gameplay completely deleted by a stray crash far away from a story checkpoint. 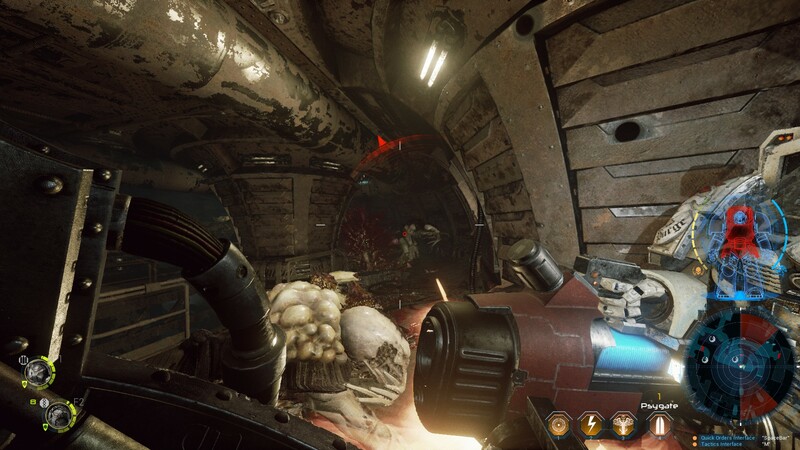 This gets even worse if you enjoy exploring every nook and cranny of the space hulk (which is necessary if you want to find the collectible relics hidden off the beaten path), because you’ll take even longer between mission checkpoints, which means that the chance to completely lose large chunks of gameplay is very real. 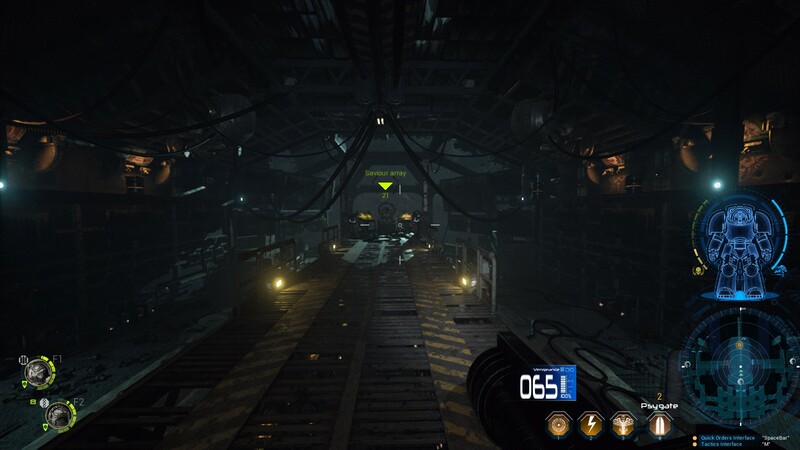 All the missions within the single player campaign can also be played in co-op multiplayer alongside three additional human players. 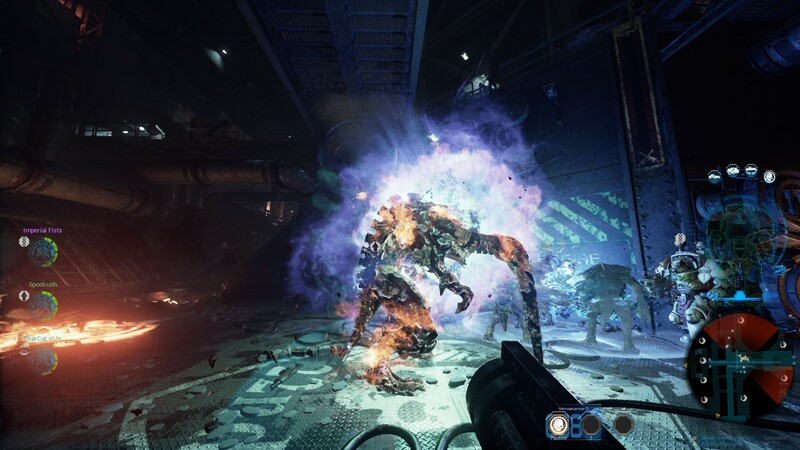 If you play in co-op, you’re not forced to play a librarian, but you can actually enjoy different classes, including an apothecary (your friendly neighborhood medic), an assault marine carryìng giant melee weapons, a tactical marine bringing to bear standard guns, and a self-explanatory heavy weapon marine. 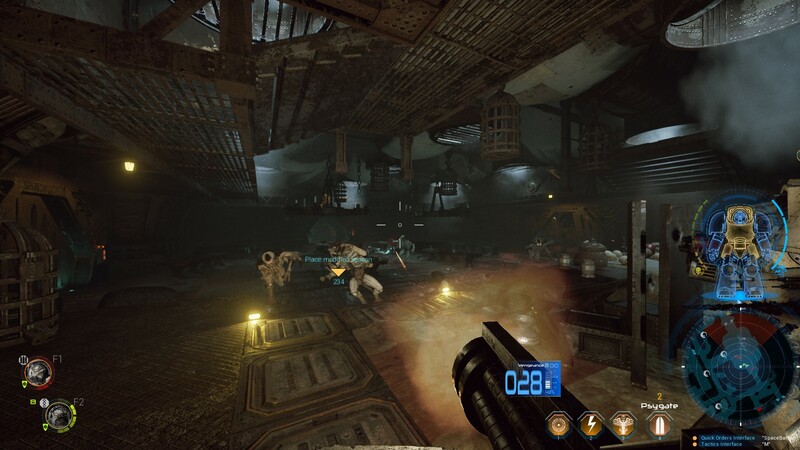 Exploring the space hulk with other human players definitely multiplies the fun (unless they’re terrible, but this isn’t exactly the game’s fault), and the tactical nature of the game definitely makes the collaborative aspect very compelling, as the four players progress through the levels guarding each other’s back and laying covering fire across every vector that the xenos can use to approach. Unfortunately, this mode is marred by technical problems as well: On top of the crashes mentioned above, finding a working match that won’t disconnect you before it even starts is often a frustrating (and at times futile) experience, but the worst comes at the end of each mission: the game has the tendency to disconnect players just after the level ends, but before experience rewards are tallied. Not once I managed to have the experience I accumulated during a co-op mission save past that hurdle, which is a fairly serious issue, considering that level progression is necessary to unlock most of the arsenal at your disposal. So unless you’re luckier than I am, you risk to always be stuck with the starting guns. My hope is that Streum On Studio will keep hammering at the game with that giant wrench I mentioned at the beginning, smoothing down the kinks that are currently cause of frustration, and that unfortunately stain an experience that would otherwise be very enjoyable. With a PS4 and Xbox One release scheduled for some time this year, there is still room for this game to fulfill its potential. Yet, the console audience is even less forgiving than PC gamers when it comes to technical problems. We can only hope that the development team will learn from the mistakes made with the Steam release, use us PC gamers as guinea pigs for as long as it takes (we’re used to it anyway), and then bring forth a more solid package on consoles.